Paris Junior College’s new 39,000-square-foot Greenville Center campus opened to students for the fall 2008 semester. PJC was established by the Paris Independent School District on June 16, 1924, in response to the community’s need for an institution of higher learning. The Board of Education elected B.E. Masters, principal of Paris High School, as dean, and the college opened its downtown campus in the high school building in September 1924 with seven faculty members and 91 students. Later, 39 extension students were added to the roll, for a total of 130 students that first year. The college moved into its own facility, the old post office building, during the summer before starting its second year. The building was donated to the Paris Independent School District by the federal government. In 1931, the college became an independent unit of the school system, and J.R. McLemore became the first president. In 1934, Paris Junior College became a member of the Southern Association of Colleges and Secondary Schools, and in 1937 the board voted to establish the Paris Junior College District, independent yet coterminous with the Paris Independent School District. The campus was moved to its present site of 54 acres in 1940, and in 1949 the first board of regents was elected and began meeting. J.R. McLemore served as president until 1961. Charles Clark took over the duties until Frank Grimes became president in 1963. Louis B. Williams succeeded Grimes in 1967 and served until 1983 when he was named president emeritus. Dennis Michaelis followed Williams and served as president until 1988. Bobby R. Walters became president in 1988 and served until 2003 when he was named president emeritus. Dr. Pamela Anglin succeeded Walters in 2003. The college began adding new facilities at its campus in 1963 and a building program continued until 1978 during which time the J.R. McLemore Student Center, dormitories, Natural Sciences and Mathematics Center, applied science annexes, Aikin Center for Applied Sciences, Center for Musical Arts, Lifelong Learning Center, married student apartments, and the Mike Rheudasil Learning Center were built. Included in the Learning Center/Library is the A.M. and Welma Aikin Jr. Regional Archives, which contains the papers of the late Senator A.M. Aikin Jr., co-sponsor of the Gilmer-Aikin Bill and member of the Texas legislature for forty-six years. In 1988, the Hunt Physical Education Center was completed to provide additional space for kinesiology instruction and is the home of the PJC Dragons basketball and Lady Dragons basketball and volleyball teams. It includes classrooms and the Dragon Hall of Fame. The college acquired and completely remodeled a building on the north side of Clarksville Street adjacent to the campus that has become the Bobby R. Walters Workforce Training Center. It houses the Health Occupations Programs, Continuing Education, Electrician, Mechatronics, Drafting and Adult Basic Education. 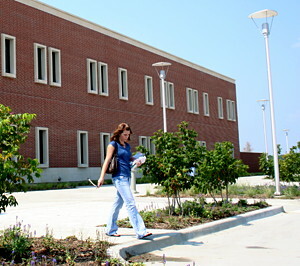 In 2010, the new South Campus Residence Hall was completed and opened its doors with 60 beds for women residents in August of that year. In 2011, a second wing was opened with 64 new beds for men. The new 42,000-square-foot Math and Science Building opened for classes in 2013. The Grimes Center was renovated in 2013 and houses Social Sciences. Paris Junior College offers Associate in Arts, Associate in Science, and Associate in Applied Science degrees, as well as Certificates of Proficiency in technical/vocational fields. The college has expanded its academic curriculum through the years to encourage associate degree and university transfer candidates. Since establishing its first vocational program, jewelry and watchmaking in 1942, the college has been aggressive in adding technical/vocational programs that will benefit students entering the workforce.